I’ll start by saying that Urban Trial Freestyle 2 is not targeted towards me. 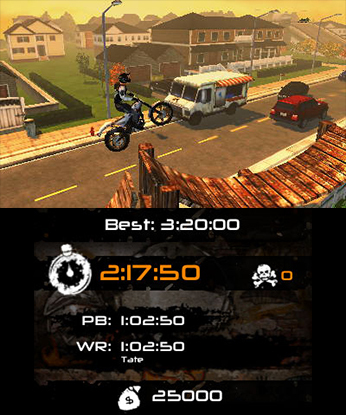 Sure, I’ve played Excitebike, but this type of game – a motorcycle stunt/racing game – generally isn’t my style. Having said that, I was surprised that I found myself enjoying this game on some level. Let’s find out why. To start with, the game looks and feels quite polished, with decent graphics that make full use of the 3DS’ capabilities. 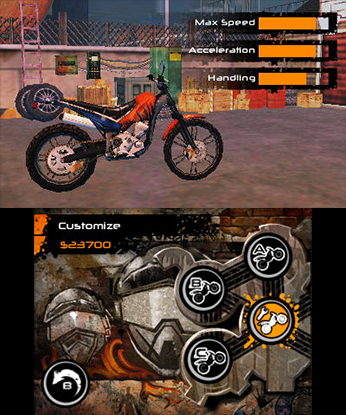 The game is played from a side-scrolling view as you move your bike from left to right, with some slight angle changes to help with that 3D perspective. The only slight downside to this is that you can’t see far ahead, meaning you often won’t know if you have enough air time for a 360 until it’s too late. To compensate, you can restart from the last checkpoint at any time, making it easier to replay sections and nail those jumps. Even if you crash, you’ll instantly restart from the last checkpoint anyway. At the end of each track, you will be penalized with a reduction in points for each crash incurred, but this doesn’t hugely impact on your score. This all contributes to making the game more accessible, even for a motorcycle novice like me. If you’re a more professional rider, you can always repeat tracks to get that perfect 5-star rating. The tracks are well designed, with some interesting configurations using everyday items and locations. There are eight tracks within each of the five areas, providing a lot of content to master. Additionally, there are two modes: Time Trial and Stunt, so you can attack each track twice, with a different objective each time, essentially doubling the content. On top of that, there are further challenges to unlock as the game progresses, plus leader boards and even a level editor. There is certainly a surprising amount of depth to this game. The audio is fine, though a little on the repetitive side, with a soundtrack that fits the scene of a garage rock band from the 90s. I found the FX quite irritating – e.g. the bike’s engine – but there are options for the volume of both the audio and FX, so you can get the balance right for yourself. One disappointment is the lack of a female motorcyclist! In fact, there is only one avatar, though you can update his outfit with cash earned from completing tracks. A lot of the smaller outfit components (e.g. gloves and boots) look very similar though. Money is easily earned, so it’s not an issue to try out a few styles. You can also unlock new bikes to ride after completing certain areas with a particular star rating. The most surprising aspect of the game for me was the controls, which are very responsive. The game is simple to pick up and play, making it accessible to all levels of playing ability. If I can perform tricks and score 4 stars (well, on one track), then I’d say almost anyone can. The game’s menu system is also good, intuitive and easy to navigate – I’m a big fan of a well-thought-out user interface, and this one is polished. 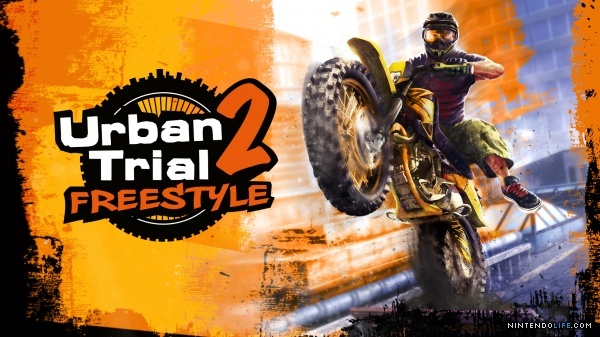 Overall, Urban Trial Freestyle 2 is the best motorcycle stunt game I’ve ever played. OK, it’s not my typical genre, but honestly, the game has decent graphics, a soundtrack that fits the genre, plenty of tracks to play, and a solid design and style throughout. Some more customization wouldn’t go astray, but at AU$9.10 (US price to be confirmed), it’s relatively good value. If this IS your genre, I’d say you should give Urban Trial Freestyle 2 a try. A solid motorcycle stunt game with a good amount of content and some nice designs. It’s not for everyone, but if you’re interested in listening to grunge music while making bikes jump over things, Urban Trial Freestyle 2 is a game you should consider trying.